Pitt men’s basketball (8-6) closed 2017 and opened conference play with a 67-53 loss to the No. 15 Miami Hurricanes (12-1) on Saturday afternoon at the Petersen Event Center. After an up and down month of non-conference play, Pitt entered Saturday’s game on a three game winning streak against mid-major opponents. Pitt didn’t find the same success in its first matchup against an ACC defense this season. The first half was dominated by defense with both teams struggling to shoot the ball early on. The Panthers held the Hurricanes to 7-20 to start the game, before the Hurricanes ended the half on a 9-0 run over the last two minutes to take a 30-19 lead by half time. The Panthers had similar offensive struggles in the first half shooting only 30.8 percent from the field in the first half. The Panthers’ offense was stymied by the absence of first-year guard Marcus Carr who sat out most of the first half after picking up three fouls early. Miami carried its momentum into the second half as they quickly increased their lead from 11 to 16 within the first three minutes of the half, prompting Pitt to call a timeout. The offensive outburst continued from there as Miami shot a much improved 53.1 percent from the field in the second half. 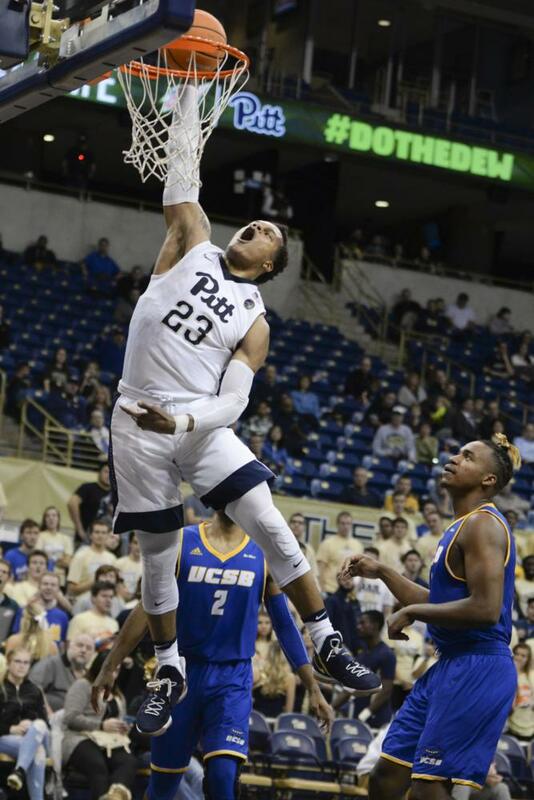 Pitt’s offensive woes continued despite a solid performance from first-year forward Shamiel Stevenson who shot 6-9 from the field for 16 points and four rebounds including a thunderous alley-oop dunk with three minutes left in the game. Aside from Stevenson’s performance the Panthers didn’t have much to celebrate as they shot only 40.4 percent for the game and 25 percent from the three point line. Pitt heads to Louisville for their second game of ACC play on Jan. 2. Tipoff is at 9 p.m.